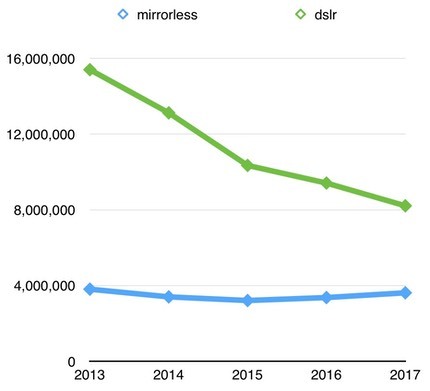 In 2011, CIPA (Camera and Imaging Products Association) figures showed us that 100% of the market of interchangeable lens cameras shipped were DLRS, this year’s finding show mirrorless sales are growing; only 64% of the market is now DLSRs. From the time frame from January to April CIPA members produced more cameras than they did the previous year. The majority of that growth came from the ‘non-reflex’ sector. While only a 3-4% increase in volume, the numbers show that the market is not shrinking. CIPA includes mirrorless cameras, compact system cameras, and rangefinder cameras in their figures (excluding the membership of Leica or Hasselblad) one could assume that most of the category is compact systems and other mirrorless cameras – like the Sony a7RII. The data shows DSLR is still the mainstream in terms of value and quantity, but for how long? The non-reflex category jumped 37.5% in Japan but in the rest of the world that growth hit 80.5%. Canon and Nikon have a formula that they seem to stick to when it comes to their DSLR segment. Albeit begrudgingly at times, the DSLR seem to absorb technology as it matures; this is evident in the fact that only a handful of DSLRs from both the giants have a 4K option. The big number 2 in the full-frame interchangeable lens camera market, Sony, continues to incorporate cutting-edge tech in their cameras, rising the market as they do that. It is interesting to see history repeat itself. As 35mm cameras shoved their larger format brethren out to become the de-facto standard of photography, mirrorless is poised to nudge out the aging DSLR. Factors such as 100% viewfinders, ‘pocketable’ 4K, and smaller, lighter rigs are anchors point for mirrorless ILCs. To see more facts and figures head over to CIPA’s Website here. But still, not enough to buy or trade. They all need to get a lot better before I give up my Canon 5D II. hahhahahahahahah your comment made my day…. there is no single category where your Canon could beat a Sony Alpha FF. “Albeit be begrudgingly at times” You said “be be”. No be be. I usually prefer longer term statistics, to smooth out local maxima and minima (generated by sales, introduction of a new models, Christmas etc.) to remove biases. If you do so, like done by Thom Hogan for the times from Mai to April the next year, you will find that mirrorless shipments stayed pretty much flat (image below, taken from bythom.com, http://www.sansmirror.com/_Media/bythom_cipa_trailing-year_med.jpeg) , with DSLR sales obviously shrinking, as we know by now. Growth in $ by now is mostly due to shifting inventory to higher priced gear. Interestingly, Canon managed to increase market share to about 48%, with Sony staying flat at around 14-16% according to their financial report recently. Canon are quite successful with mirrorless bodies (like m5), too. Having DPAF, they already own the technology to go mirrorless immediately, if required. I find these articles fascinating, the ever increased fascination and desire by people to see DSLR fail and Mirrorless succeed. It looks like a constant desire to justify their obsession with Mirrorless. It is a different technology, DSLR is highly successful, that has developed technology, improved the sensor, focus systems, speed, lens technology etc for Mirrorless to use and develop for their own systems and technology. Also, the reality is that millions of DSLR users have invested in systems, lenses etc, why would they all dump their equipment and jump to mirrorless at hugh cost to systems with limited lenses, limited service infrastructure, and what has become very expensive systems, what does Sony or Fuji or Olympus offer in the consumer market? at how much more than C and N? Then battery life, size benefits are disappearing as Sony realise a FF lens is a FF lens, you cannot make it smaller. Why is 4K such a game changer? Go to any retail outlet that sells Camera gear and ask them what percentage of people buy DSLR’s or Mirrorless for Video? reality is less than 10%. Video is incidental for 90% of the market as 90% plus take video to post on social media and this is done via mobile phones. The Pro Market is something else. But what % of the total camera market consist of the Pro Market? So really, become a bit objective and see each technology for what it is. Most people who write their stories ” why I changed from Canon or Nikon to Mirrorless” if you look at their work you understand why, they change systems with the hope their work improve, There are legitimate cases and have seen and worked with people who made the change due to size, from a Canon or Nikon and even Sony FF system to a m43 system. These stats are also out of context as it represents Q1 of 2017 and represent units shipped. It does not take into account the actual user base.. I highly disagree with the most of your arguments, but youre right in one point. CHANGING SYSTEMS WILL NOT, IMPROVE YOUR PHOTOGRAPHY. But you didnt understand the advantages of mirrorless systems, thats why i highly doubt that you know anything about hybrid shooters or the benefits of an IBIS or Focus points across the whole Frame. Maybe you dont know anything about the EVF, which can display you anything you want, you also can see in Black and White, which for me was a real GAMECHANGER! … you also can see the In-Focus Area (Focus Peaking) and you can also see how your white ballance changes. No Mirror means NO MIRROR MOVEMENT. anyway i would only suggest Mirrorless cameras for people who know how to use their advantages. BTW. : i shot 2400 pictures with 49% battery left on my Main Camera (Sony A7R III) show me how your Canikon can achieve this in LIFEVIEW mode :) ?